Review: Ballet Boyz. Life. Nottingham Playhouse. – East Midlands Theatre. 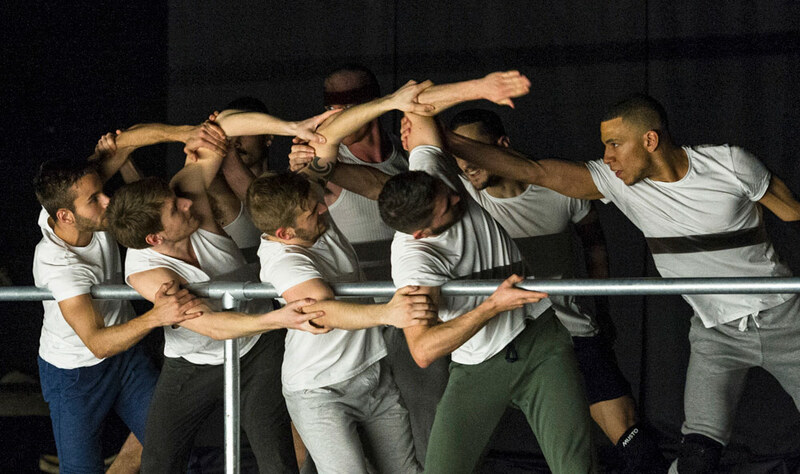 Glowingly confident from a triumphant US tour, renowned all male British dance company Ballet Boyz, begin their short European tour at Nottingham Playhouse. This coincides beautifully with the imminent Dance4 NottDance Festival 8-12 March. The ten dancers wow the packed theatre with their two part programme Life containing two dance works Rabbit and Fiction. Rabbit – a wonderfully surreal kind of ‘Laban meets Les Lapins’ is choreographed by Pontus Lidberg. With the majority of the dancers sporting realistic human sized rabbit heads the interpretation is very much in the head of the onlooker. 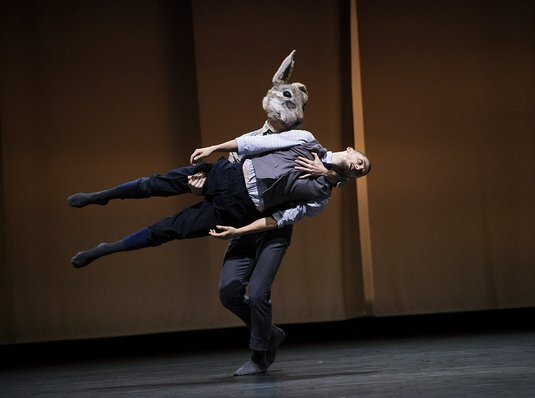 We are not talking of a cute Sadler’s Wells style Beatrix Potter ballet with Peter Rabbit and his fluffy friends here, nor are we in so dark a vision as Donnie Darko. Rabbit is created with music from Kleines Requiem für eine Polka by Henryk Milolaj Górecki and Lidberg himself quotes that the dance work is ‘… like looking at a painting … looking at it will say more about yourself than the painting.’ The work is not without some humour as it whispers its notions about placement in society; about being the odd one out and the masks we all accept or deny wearing in order to belong. As with all the Ballet Boyz exemplary dance works Rabbit is performed with strength and control, passion, an understanding of character and deep commitment to contemporary dance. Micheal Nunn and William Trevitt’s artistic direction of the company is continuously innovative and the impressive lighting design for both works tonight is by James Farncombe. The dancers for both pieces are Simone Donati, Flavien Esmieu, Marc Galvez, Edward Pearce, Harry Price, Matthew Rees, Jordan Robson, Matthew Sandiford, Bradley Waller and Josh Wild. The second half brings us Fiction yet the story pertains to bring us fact. Through a faulting male voice over that regulates the dancers at the barre each time a mistake is made in either medium of expression, we are led to believe that choreographer Javier De Frutos is dead. We continue to hear that De Frutos had an amazing reputation in life for his ground breaking choreography but was controversial in his risk taking to the point of audiences walking out of some of his shows. The dancers respond to the announcer’s words as if they are a form of music to dance to. The voice over words are spoken with the voices of Iseme Brown, Jim Carter, Sir Derek Jacobi CBE and Imelda Staunton CBE. As the piece progresses a female voice overlays the story of De Frutos and the energy of the dance increases in temperature to the point of aggression and anger over the death. Fiction is also filtered through and depicted with a huge amount of humour and individual character interpretation. Eventually, Ben Foskett’s music score P. Jabara Last Dance kicks in and we witness the Ballet Boyz at their compelling best. Through Fiction the dancers demonstrate their hard won skills with total body connectivity, energetic dynamics, bravery, total trust in each other and terrific command of the space where everything has a focus – even walking. Not a single member of the Nottingham Playhouse audience for Life walked out of either piece but you can bet your ballet pumps that they will always return for such superb contemporary dance the like of which Ballet Boyz excel at.